Building a brand is an extensive process that can oftentimes be overwhelming. To make the process smoother and help you understand what to expect, I’ve outlined the branding and logo process into 4 major steps. This first phase is incredibly important. I will do a deep discovery session to learn as much as I possibly can about you, your business, your goals, and your expectations. This information will be be used to create a brand strategy that will guide you on how to properly use your brand on any medium. The discovery phase is required because I believe that I need to understand you and your business in order for the project to be successful. Once the discovery session is complete, I get to work on creating stylescapes and mockups. Once the stylescape is approved, I will use said stylescape to create a presentation that will include a mockup of the visual branding elements (logo, submarks, etc.). Branding is more than a logo – we will use this presentation to review what we uncovered during the discovery and how that information can come together to create your brand story. Once we go over the presented branding elements, I will go back and make any final revisions. I generally offer two rounds of final revisions (slight adjustments, not concept changes). Once the branding elements are complete and any final payments have been made, you will receive all the branding elements and necessary files for those elements. Specifically, you’ll receive: .eps file of the logo, submark, and icon along with PDFs and .png files. Included will also be a branding style guide containing your brand story, your brand’s colors and typography, rules for how to apply your branding elements and how to use your typography and color palettes, and examples of how everything can come together to create an on-brand graphic. This will be sent as a PDF. In the Discovery Phase, I gather information about your brand. I will collect information from your website (if you have one). your social media, marketing collateral you have, and anything else that will help develop your message and story. We’ll hop on a call to discuss what is working (and what isn’t), your goals, and needs. If necessary, I may ask you to fill out a branding workbook. Discovery shouldn’t be rushed. In order for me to successfully create solutions that meet these goals, I need to understand who your business is, what your business goals are, and why you do what you do. I can’t read minds. Neither can you. It’s important that we communicate as efficiently and as openly as possible. If you aren’t understanding a question or don’t know how to answer, that’s perfectly fine. Just let me know! We can figure it out together. I use Zoom to conduct my meetings. I will also do phone calls if that is easier for you. It’s important that we discuss everything in a manner that allows us to quickly ask questions, get to know one another, and ultimately cover as much ground as possible. 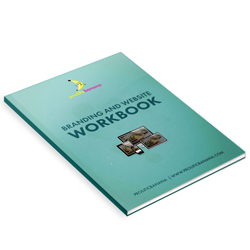 If we are unable to complete everything, I may ask you to fill out a branding workbook as well. In the Design Phase, I research your business industry, your target market, and your competitors. We need to see what’s going on from a bird’s eye-view. This information, combined with everything we uncovered during the discovery session, will be used to develop a brand concept. Before I even open up a design program, I sketch. I take my time to sketch out rough ideas, work out placement and hierarchy of elements for the logo, and ultimately decide what will work and is worth developing further. Once I’ve settled on the best possible solution for your branding, I will create a mockup of your brand as well as a presentation to show how this mockup could be used in real life. This will contain your brand story, colors, and other visual elements. Many designers offer a variety of choices for logo design. I typically present one fully-developed idea for you to consider. You’re hiring me because this is what I do. I’ve researched and problem-solved this particular concept and I truly believe that what I present to you will help you reach your business goals. It’s easy to get emotional and let personal opinions influence us. It’s important to remember the goals of the branding project while reviewing the mockup. It’s all about what your target market wants and how you want to make them feel and view you. Please refrain from using comments such as “needs more ‘umph'” or “I don’t like it”. Neither of those comments are specific enough to inform me about what specifically needs to change or be discussed. Be as specific as you can be if there is something that isn’t working. This is were we finalize your branding elements and prepare for the file delivery. After the presentation, I will back to the branding elements and make any revisions that need to be made. I include up to two minor revisions (if you want to see a different concept, that will incur an extra charge). Once the branding is finalized, revisions are completed, and any outstanding invoices are taken care of, you will receive all of the necessary files for the various branding elements. This includes a .eps file (vector file that can be opened with a vector program like Adobe Illustrator. Oftentimes you’ll need to send this to a printer for various artwork like shirts, signs, etc. ), a PDF of the main logo, secondary logo, and submark, as well as .png files for the visual elements. You’ll also receive a branding style guide that will contain your brand story, colors and typography, rules for how to use these colors and typography throughout your marketing materials (website, social media, print materials), and examples of how everything can come together to create an on-brand graphic. I keep a copy of the entire project for up to 3 months. After that, I archive the project. A fee may be incurred if after this time you need me to send you files. A copy of your project will remain on the shared Google Drive folder for up to 3 months. As previously stated, after that 3 months, the folder and project will be taken down and archived.